The reliability of this forecast is low. We recommend a look at the multimodel. The location marker is placed on Bellarena. The location marker is placed on Bellarena. 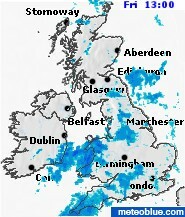 This animation shows the precipitation radar for the last hour. Drizzle or light snow fall might be invisible for the radar. Precipitation intensity is colour coded, ranging from light blue to heavy purple. 0” precipitation in Bellarena at 23:15-00:30. The animation shows the distribution of precipitation for the next hour. Lightning of the past half hour is displayed as red crosses. Bellarena is located in the center.